For more than 75 years, The Marine Room has welcomed residents, travelers, celebrities, and world figures to its surfside establishment for unparalleled seaside views and inspired coastal cuisine. From fresh seafood to innovative seasonal dishes, The Marine Room is one of San Diego's best restaurants and one of the region's most iconic dining destinations. Since its opening in 1941, The Marine Room has become renowned for its front row seats to spectacular sunsets over the Pacific and the pounding high-tide surf that creates dramatic displays outside the restaurant windows. All tables, both window-side and elevated booths, offer captivating views of the waves. 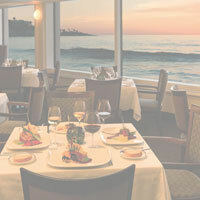 With award-winning Executive Chef, Bernard Guillas and Chef de Cuisine, Thomas Connolly at the helm, their team of tastemakers have introduced a culinary renaissance in La Jolla with dishes like Rooibos Tea Spiced Baja Prawns, Togarashi Sesame Spiced Ahi Tuna, and Center Cut Black Angus Filet Mignon. The Marine Room is a perfect venue for any celebration from weddings and anniversaries to birthdays and milestones. Gather with friends for shared small plates or host intimate dinner parties unlike anything else. The up-close view of the surf more than matches the creative cuisine, making this La Jolla restaurant a famed tradition. The seahorse symbol has become synonymous with sophisticated fine dining with a sense of delight. The Marine Room has earned countless accolades and awards over the years, but our greatest satisfaction comes from merely serving our guests - who come to celebrate the joy of life with good company, a perfectly-prepared meal, and a golden Pacific sunset to call their own.